Retiring and Relocating to Costa Rica is becoming more and more popular. The number of expats in Costa Rica are rising steadily every year. Understandable, when you think about all the beautiful beaches, rainforests, and rolling mountains it has to offer. However, before you take the big step and leave your old life behind, you should weigh up all the pros and cons first. 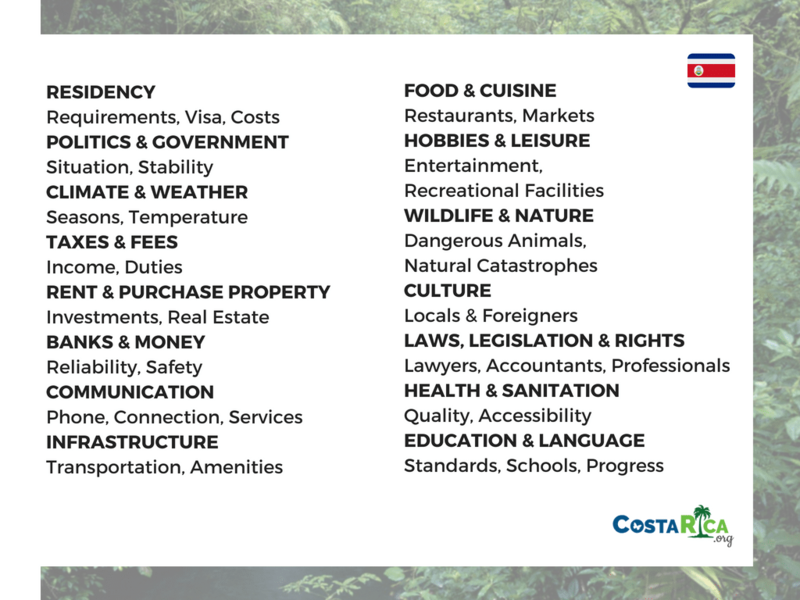 Because besides insurance, laws, and moving to Costa Rica, there are several other important things you need to consider. But do not worry, we are here to help you with that! We can help you with residency, language, opening a bank account, health care, and more. Before you move here, we highly recommend taking a Tour with our Relocation and Retirement expert Christopher Howard. 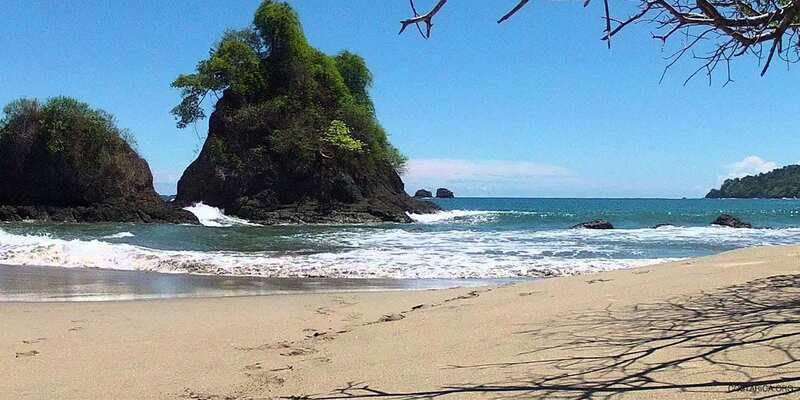 During this experience, you will be able to get valuable information on retiring in Costa Rica and get to explore this tropical paradise a little more! Contact us to get more information on this package. We are more than happy to set you up on this Tour! Where are you going to relocate to? Out of all the locations you could decide on, relocating to the Central Valley might be the most sensible. After your tour you will have seen all the beauty Costa Rica has to offer. To help you understand the advantages before that, we have collected the three most important things this region provides. Because after all, we want you to help figure out what is best for you! Unfortunately, we are all growing older and who doesn’t have something aching here and something pinching there. That’s why we cannot forget about healthcare! The Costa Rica health care is so good that it has been ranked among the Top 20 worldwide! It consists of two different units. The affordable public health care system (La Caja) and the private health care system (INS). These have resulted in one of the highest average lifespans globally. Costa Rica’s hospitals offer top-notch services with highly experienced experts and specialists. 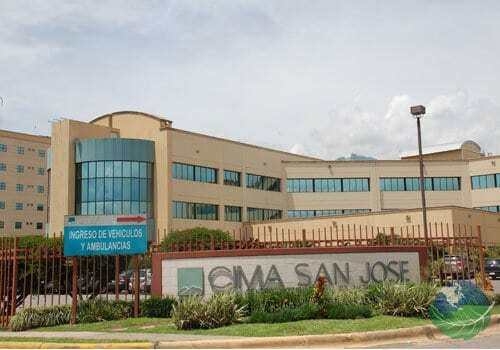 As these hospitals are located in San José and its surrounding suburbs, it is a no-brainer to move into the Central Valley to take advantage of this convenience when needed. Even Medical Tourism to Costa Rica has become more and more important and popular due to the quality and the prizes. 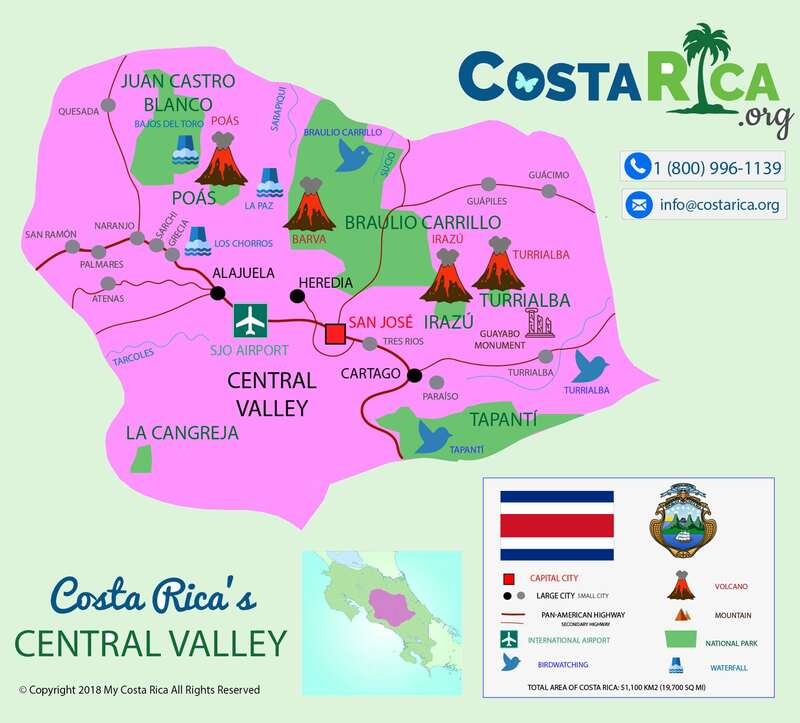 In all of Costa Rica, the Central Valley is probably the most developed when it comes to roads and highways. Although you will find highways snaking through the entire country, there are still a lot of dirt roads, especially on the coastlines. The Central Valley is well connected to the rest of the country offering a lot of public and private transportation opportunities. Here, you will also find the International Airport connecting you to countries around the world and offering several domestic flights. Furthermore, it offers excellent shopping including dozens of malls and major shopping centers. The best ones are probably the central street, the central market, and the artisan market in San José, the main street, and Multiplaza in Escazú, Mall San Pedro, Plaza Real Cariari, and several farmer’s markets in and around San José. Besides that, you can also attend a whole bunch of tours and activities in this region including coffee tours, as well as day tours to gardens, and wildlife parks. You are also able to reach both the Caribbean and Pacific coast quite easily. The year-round spring-like temperatures are definitely one of the biggest pros the Central Valley has to offer. You will be able to enjoy temperatures varying from average highs of 87° F to average lows of 60° F (31° C to 16° C) depending on your exact location. 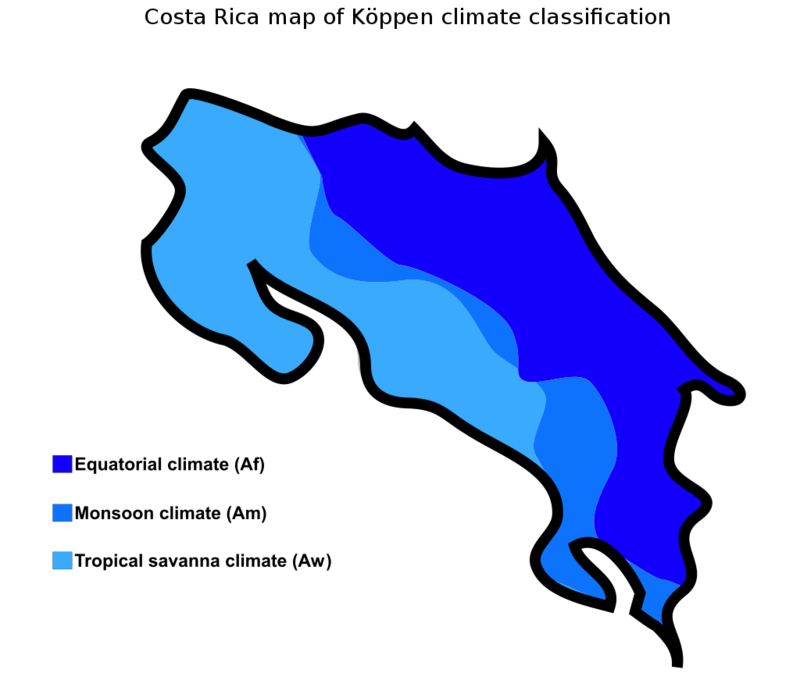 Although you find these constant temperatures, Costa Rica holds two seasons: the dry season and the rainy aka green season! In the Central Valley, you will experience the dry months from December to April, whereas the rainy months are from May to November. Still, there is no need to panic! Rainy season does not mean that it will rain the entire day. Typically, you are able to enjoy the sun in the mornings and and listen to the showers in the afternoon. However, the most fascinating observation you can make during this season is the country changing completely. Everything starts to flourish and bloom again after the dry months. The Association of Residency in Costa Rica (ARCR) is an organization that serves foreign residents and people who wish to become residents of Costa Rica. They inform, advise, and assist people interested in relocating about the process and legal matters. Furthermore, they organize social activities for members, as well as promoting participation in Costa Rican culture and society. ARCR members can also take advantage of various services and benefits such as assistance with governmental departments, resident applications, ID card renewals, file updates, working permits for domestic employees, property and vehicle title searches, credit checks and many more. They will help you to connect with reliable professionals and suppliers, as well as getting to know courier services and international mail. This Checklist gives you a quick overview of the most important things you will need to think about before you are relocate to Costa Rica. The ARCR will be there for any questions concerning these points and more! Every last Thursday and Friday of the month (except for December) the ARCR holds a seminar on all these topics inviting lawyers, linguistics, expats, and several other experts on the topic. If you are interested in participating in such a seminar, ask our travel coordinators to sign you up for one! If you decide to participate in such a seminar, you will also meet our Relocation and Retirement expert Christopher Howard. He is a 31 year resident and citizen of Costa Rica, who has written several books on retirement and living in this tropical paradise. He will give you an honest review of the experiences he has made during the years and will fill you up with lots of valuable information about your big move. During your 2-day Costa Rica Relocation Tour with Christopher, you will be able to get answers to all the daunting questions you may have concerning your Relocation or Retirement. What is one of the most important things before you move to a different country? Exactly, you should get all the information you possibly can! From guides and maps to pictures and videos, we have got you covered. Costa Rica has been selected as the easiest country to live in and number 1 retirement destination worldwide in 2018 by International Living! In 2015 Costa Rica became second in the Annual Global Retirement Index! Costa Rica received the second place in the healthcare category of 2015 index offering a high-quality, government-run universal health care system for citizens and legal residents! It is probably impossible to collect all the characteristics Costa Rican culture includes. But if someone would try to summarize it in one quick paragraph it would most likely sound something like that: Costa Rica embodies its indigenous origins, as well as its Spanish colonial influence with a good impact of immigrant cultures such as Jamaican and Chinese. The country’s inhabitants are called Ticos and they are very proud of their system, their values, their long-standing democracy, and their conservation and environmental efforts. The spoken language is Spanish, however, it does have its own twist and a lot of typical Costa Rican phrases. The most significant has to be Pura Vida, which is much more than just a sentence, but rather a lifestyle. Pure Life and open-mindedness towards all creatures and people visiting this diverse, tropical country. Welcome to paradise! Easily overwhelming is the richness of Costa Rica’s nature and wildlife! World-renowned for its biodiversity with more than 500,000 species of animals, the country can drive its visitors and inhabitants wild with excitement! Besides the breathtaking variety of endemic and endangered species such as birds, reptiles, amphibians, insects, fish, and mammals, thousands of plant species call Costa Rica their home. As Costa Rica is so unique you will definitely need some time to explore and get used to all the flora and fauna it has to offer, as it is probably extremely different from your home country.